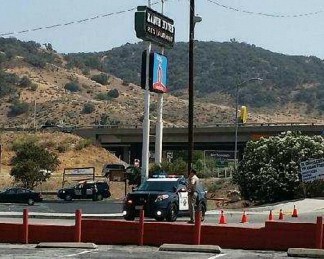 GORMAN, CA (Wednesday, Aug. 1, 2018 at 3:25 p.m.)—The Mountain Enterprise received a call at 3:17 p.m. from a worker in Gorman who said CHP and L.A. County Sheriff’s deputies came in and asked if she had seen [three male youths]. “Now they’re checking cars and have the road blocked,” she said. In the photo you can see Gorman Post Road and the northbound Interstate 5 off ramp are blocked by CHP vehicles.